My husband is a HUGE Notre Dame fan! Unfortunately, he works on Saturdays and can't watch the game live. I always tape the game and we watch it together when he gets home from work. He inpatiently waited until Sunday afternoon so we could watch the game with my brother. It's too bad my husband saw the final score run across the bottom of the screen when we were watching the TCU game Saturday night! We needed some good snacks to go along with the big opening season game, so I made some taquitos, rotel dip, and homemade salsa. My girls enjoyed the fruit tray with the Irish fruit dip (sorry, forget to take a picture). You can fill your taquitos with whatever your family likes or whatever leftovers you have in the fridge. I made chicken and cheese, steak fajita and cheese, and just plain cheese taquitos. Once you learn the method it's easy. This method does not involve holding them together with any toothpicks. You can either fry them in vegetable or canola oil, or spray them with butter cooking spray and bake in the oven for a healthier version. I fried them this time because I wanted authentic taquitos. Enjoy! In a medium sized bowl, add chicken, shredded cheese, cumin, garlic powder, salt, and pepper. Put a tortilla on a microwavable plate and brush top side with oil, stack another tortilla on top and brush top side with oil, and repeat this process for all tortillas. Cover with a damp paper towel. Microwave on high for 30 seconds. In a large skillet, pour enough oil in to cover taquitos half way for a shallow fry. Heat oil to about 325 degrees. On your work surface, lay a tortilla down, put a row of filling across the middle, and roll up tightly. Lay seam side down on a baking sheet until ready to fry. You can test your oil by dipping the very end of a wooden spoon in the oil. If small bubbles form around it, the oil is the right temperature. Use tongs to pick up a taquito and place seam side down in the skillet. Hold down for a few seconds to make sure seam seals together. Cook for 1-2 minutes, then turn over to cook the other side until golden and crispy. Remove to a paper towel lined baking sheet to drain excess oil. We cooked Carne Asada (Steak Fajitas) for dinner last night, and had some leftovers. 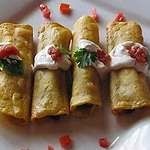 I decided to cook up some more taquitos for a quick lunch today using simply the steak fajita meat and shredded cheddar cheese. The fajita meat has plenty of flavor and did not need any extra seasonings. My oldest daughter prefers cheese taquitos so I cooked up some with shredded cheddar cheese. She dipped them in sour cream since we ate all the rotel yesterday. Arrange the cooked taquitos on a serving platter with all your favorite condiments. We like rotel dip, sour cream, Homemade Salsa and guacamole. Enjoy! When you brush each tortilla with oil....do you brush both sides?